- Calculation Tools, including Flux Density and Pull Force Determination. Neodymium magnets are dark gray alloy. They are composed of neodymium, iron and boron. Density of Neodymium magnets is .27Lb/in3 (7.5g/cm3). Neodymium magnets are manufactured in a metallurgy process through alloying, crushing, powdering, pressing w/magnetic orientation, sintering, then cutting, coating, inspecting and packing before shipment. (BH)max, the maximum energy product, of neodymium magnets is highest of any kind of permanent magnets today in the world. 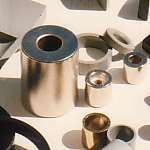 (BH)max at different grades of neodymium magnets is 27 to 52 MGOe. Neodymium magnets have extremely resistance to demagnetization with Hci, Intrisic coercive force, over 12,000 Oe. Because of very high (BH)max and Hci, neodymium magnets could be used as a reversible medium for large amount of energy transformation in miniaturized application where a strong magnetic demagnetization field exists , such as computer hard drive. Armstrong Magnetics N40 neodymium magnets in disk and rectangle shapes for customers' immediate needs and accept special orders for custom neodymium magnets. Br of neodymium magnets are much more than 11,000 Gauss. Therefore, Neodymium magnets have strong holding strength on metal surface and could be used as component for holding, separating, etc. Neodymium magnets must be carefully handled to avoid personal injury and material damage due to its extremely magnetic strength and brittle property. Neodymium magnets lose -0.09 ~ -0.13% of Br/oC and can work stably under 80oC for low Hci Neodymium magnets and 150oC for high Hci Neodymium magnets. Surface protection is strongly recommended, such as plating,	varnishing and encapsulating. Neodymium magnets can be abrasively machined with coolant served to absorb heating and dust. Without coolant, rare earth magnets could crack and chip by the heat produced during high speed cutting or grinding, and the sparks contain the easily oxidized grinding dust that could cause fire! Unless otherwise specified, tolerance on dimension of magnetization is +0.005". Other dimensions are +1.5% or +.010", whichever is greater.